CANNABIS CORPSE's last full-length album, The Left Hand Pass, was released in 2017 via Season of Mist. The band is led by the imitable Phil "LandPhil" Hall (MUNICIPAL WASTE) and his twin brother Josh "Hallhammer" Hall, who are also joined by guitarists Ray Suhy (SIX FEET UNDER) and Brandon Ellis (THE BLACK DAHLIA MURDER, ARSIS). Under the influence of the genre legends who preceded them, the trio give rise to unrelenting piece of crushing, weed-themed death replete with their signature, THC-fueled, horror fiction lyrics. 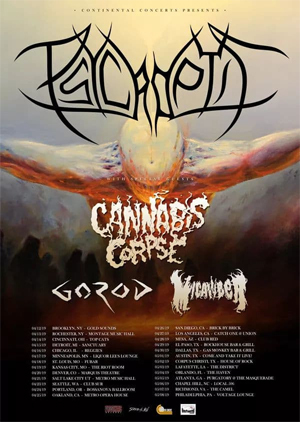 As tracks such as "The 420th Crusade", "Chronic Breed" and the title track illustrate, Left Hand Pass is another massive step-forward for the band and a monumental piece of U.S. Death Metal.